An artistic conception of the early Earth, showing a surface pummeled by large impacts, resulting in extrusion of deep seated magma onto the surface. At the same time, distal portions of the surface could have retained liquid water. Credit: Simone Marchi/SwRI. New research shows that more than four billion years ago the surface of Earth was heavily reprocessed – or melted, mixed, and buried – as a result of giant asteroid impacts. 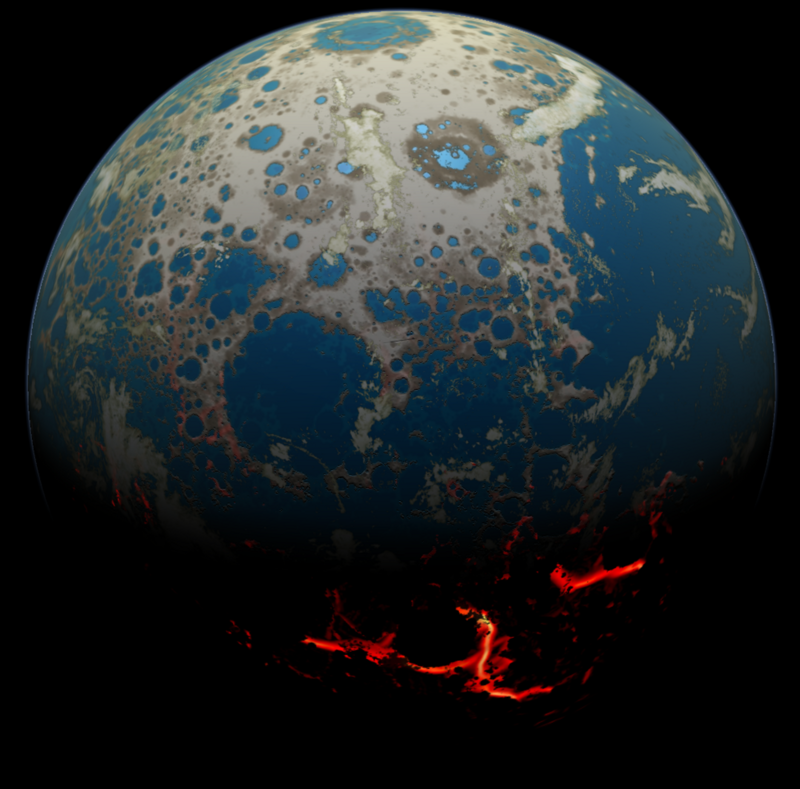 A new terrestrial bombardment model, calibrated using existing lunar and terrestrial data, sheds light on the role asteroid collisions played in the evolution of the uppermost layers of the early Earth during the geologic eon called the “Hadean” (approximately 4 to 4.5 billion years ago). An international team of researchers from academic and government institutions, including NASA’s Solar System Exploration Research Virtual Institute (SSERVI) at NASA’s Ames Research Center in Moffett Field, California, published their findings in a paper, “Widespread Mixing and Burial of Earth’s Hadean Crust by Asteroid Impacts” in the July 31, 2014 issue of Nature. Spatial distribution and sizes of craters formed on the early Earth. Each circle indicates the final estimated crater size; color coding indicates time of impact. Credit: Simone Marchi/SwRI. Terrestrial planet formation models indicate Earth went through a sequence of major growth phases: initially accretion of planetesimals – planetary embryos – over many tens of millions of years, then a giant impact by a large proto-planet that led to the formation of our moon, followed by the late bombardment when giant asteroids several tens to hundreds of miles in size periodically hit ancient Earth, dwarfing the one that killed the dinosaurs (estimated to be six miles in size) only 65 million years ago. Researchers estimate accretion during the late bombardment contributed less than one percent of Earth’s present-day mass, but the giant asteroid impacts still had a profound effect on the geological evolution of early Earth. Prior to four billion years ago Earth was resurfaced over and over by voluminous impact-generated melt. Furthermore, large collisions as late as about four billion years ago may have repeatedly boiled away existing oceans into steamy atmospheres. Despite the heavy bombardment, the findings are compatible with the claim of liquid water on Earth’s surface as early as about 4.3 billion years ago based on geochemical data. The new research reveals that asteroidal collisions not only severely altered the geology of the Hadean eon Earth, but likely also played a major role in the subsequent evolution of life on Earth as well. Large impacts had particularly severe effects on existing ecosystems. Researchers found that on average, Hadean Earth more than four billion years ago could have been hit by one to four impactors that were more than 600 miles wide and capable of global sterilization, and by three to seven impactors more than 300 miles wide and capable of global ocean vaporization. The research was an international effort led by Marchi and William Bottke from the Southwest Research Institute in Boulder; Linda Elkins-Tanton from Carnegie Institution for Science in Washington; Michael Bierhaus and Kai Wünnemann from the Museum fur Naturkunde in Berlin, Germany; Alessandro Morbidelli from Observatoire de la Côte d’Azur in Nice, France, and David Kring from the Universities Space Research Association and Lunar and Planetary Institute in Houston. The Center for Lunar Science and Exploration, a division of the Lunar and Planetary Institute and SSERVI team, is posting movies on this subject for students, faculty, and the general public at www.lpi.usra.edu/exploration/HadeanEarth. Links to other illustrations of the early Earth are also available on that education resource page. For more details about the new research, visit http://www.nature.com/nature/journal/v511/n7511/full/nature13539.html. 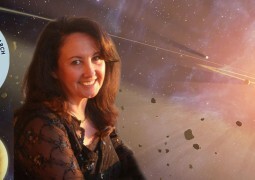 For more details about the Impact-Origin of Life Hypothesis, visit http://www.lpi.usra.edu/science/kring/Kring_Cataclysm_ConceptDevelopment.pdf. An article on SSERVI recently appeared in Astrobiology Magazine.